Social anxiety disorder / social phobia explained. Social anxiety (also known as social phobia) is often confused for shyness. But shyness and social anxiety are two different things. Shyness is a personality trait and doesn’t have to come with negative emotions and feelings that come with social anxiety disorder (social phobia). Although many people with social phobia are shy, it’s not a prerequisite for social anxiety disorder. But what is social anxiety disorder if it’s not shyness? This page will answer this question and illustrates how someone may develop social anxiety and how it affects someone’s life. At Barends Psychology Practice, we offer (online) therapy for social phobia. Contact us to schedule a first, free of charge, online session. (Depending on your health insurance, treatment may be reimbursed). The social phobia circle explained. What are social phobia symptoms. What are social phobia safety behaviours. Which social phobia causes are there? How does social phobia treatment look like? Online counseling for social phobia. 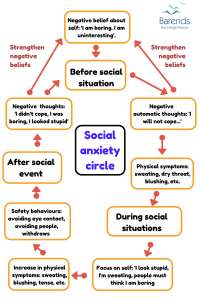 Social anxiety disorder (is also known as social phobia) is an anxiety disorder characterized by an excessive and unreasonable fear of social situations. Self-consciousness and intense nervousness (anxiety) is the result of fear of being watched, criticized and judged by others. Someone with social phobia, usually, is afraid to make mistakes, to be embarrassed or humiliated in front of others, and to look bad. Avoiding social situations or a lack of social skills can increase this fear. This same fear can make someone insecure and eventually cause someone to make mistakes or experience embarrassing moments. These bad experiences often make someone to avoid social situations or to endure them with extreme distress. Social anxiety disorder negatively affects peoples daily lives. In the worst case the anxiety triggers a panic attack. Because not every social situation can be avoided, people with social phobia usually have some safety behaviours: taking a friend to a social situation, or having a phone within hands reach. Sometimes they need their purse wherever they go. 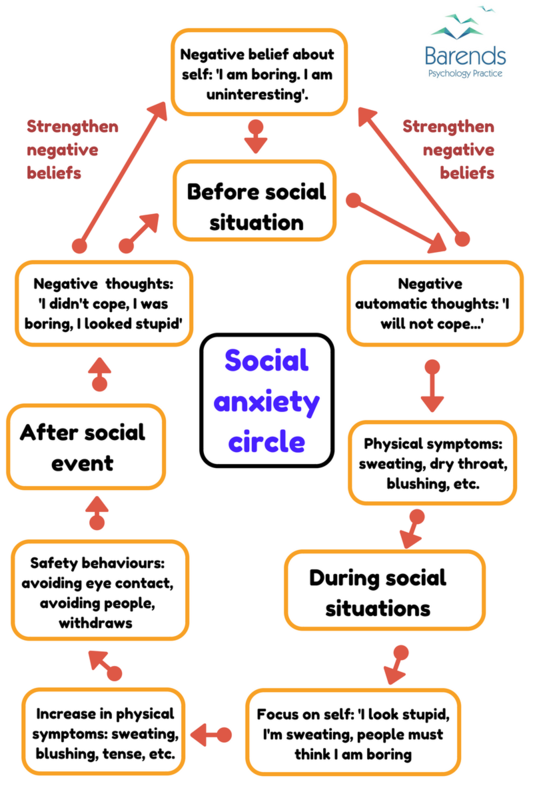 The social anxiety circle explained. If left untreated social anxiety can develop into social anxiety disorder (social phobia) and negatively affect your life. The problem with social phobia is the distorted way of thinking. People with social phobia have false beliefs about social situations and the negative opinions of others. These false beliefs may make someone overly self-conscious, may lead to high self-attention after an event, or may cause someone to have high performance standards for themselves. Aria is a 36 year old woman living in Dubai. As a 16 year old teenager, Aria experienced an embarrassing moment: during lunch break one of her friends told a joke which made Aria laugh so much that she peed in her pants. Her friends made fun of her and they kept teasing her with it for years. This experience made Aria a little insecure in the beginning: ‘will I pee in my pants again? Do I have a weak bladder?’ During social situations Aria tried not to laugh at all anymore, because she was afraid of peeing in her pants again. During interactions with friends she became more silent and even withdrew a bit. Slowly Aria became more and more insecure. She became more and more self-conscious during social situations: ‘everyone is watching me’ and when people looked at her she thought people were talking about her. This made her more insecure and nervous before social situations took place. She developed social anxiety. She started avoiding soclal situations, or endured them with a lot of distress. Her negative beliefs about herself: I am boring, I am uninteresting. If I laugh I pee in my pants. Long before social situation she would be very nervous and worry about what might happen during the social situation. Negative automatic thoughts: I will not cope with the situation. I will pee in my pants when I laugh. People know I peed my pants. Physical symptoms: she starts sweating and gets a dry throat. She blushes when she sees friends or acquaintances. (Sometimes she avoids the social situation using a bad excuse). During social situation: her social anxiety accompanies her all the time. Whenever she laughs she tries to stop with it immediately and wants to check whether or not she peed her pants. She is also afraid to be humiliated again so she avoids spontaneous actions and is even afraid to speak her mind freely. Focus on herself: I look stupid, I’m sweating. I am boring because I hardly ever laugh. Increase in physical symptoms: sweating and sweaty hands, blushing and tense. Safety behaviours: she avoids making eye contact, avoids people and withdraws. Often she serves drinks, so that no-one can start a conversation with her. Going to the rest room to check up on herself. She usually takes a friend to a social situation, because with her friend she feels comfortable and experiences less physical symptoms and distress. After the social event: she starts analysing the social situation and automatically focuses on the negative thoughts. Negative thoughts: I looked stupid, I didn’t cope.I didn’t talk to anyone, people must think I am boring. They must have thoughts I smelled, because they were looking at me strangely. It is better to stay home next time. These negative thoughts strengthen her negative beliefs about herself (and the circle starts all over again). Aria got stuck in the social anxiety circle and now at the age of 36 she notices she has no friends at all and is fully occupied with work. She tried to go on dates a few times, but without success. Her mother suggested her to go to a therapist, but Aria doesn’t dare to go out. After some months she decided to try online counseling.